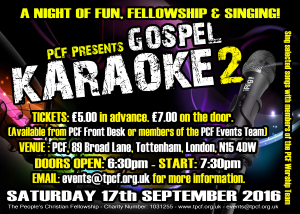 Following on from the successful Karaoke event earlier this year, PCF is now bringing you part 2! Why not come along with a friend or 5! Tickets are £5.00 in advance, and £7.00 on the door and it’s all taking place at Springfield Hall. Contact events@tpcf.org.uk or speak to a member of the Events team for tickets.